For those nights where you have no time for prep, these sweet and spicy meatballs come together in a flash. Serve over steamed rice with green peas on the side. They also make a great appetizer. Put meatballs in a oven safe container with a cover. 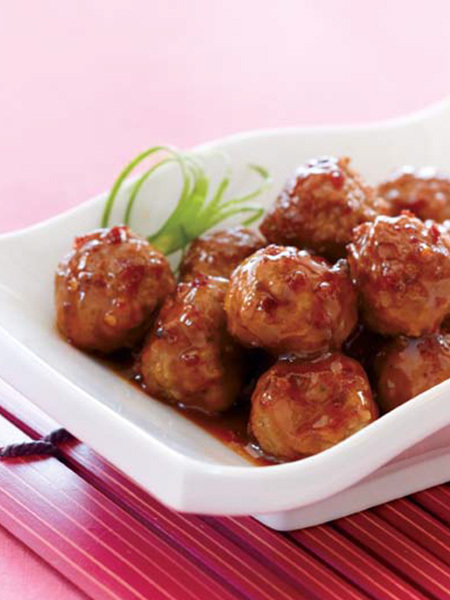 Add bottle of Teriyaki Experience Sweet Chili Sauce over meatballs. Use the Teriyaki Experience Sweet Chili Sauce bottle and fill bottle half-way with water. Pour over meatballs. Bake in oven for 1 hour or until meatballs are heated through and sauce has thickened. Serve as a side dish on a buffet or over steamed rice. For a flavour variation add a drained can of pineapple tidbits in the last 15 minutes of cooking time.